There is not alote to know about me i guess haha.ive been through alote but who hasn't.i just try to make everyday the best I can because we got one life to live so we might as well enjoy it :Palso I put alote of effort into my writing .though it is hard I accept criticism because how else are you to get better.haha I apologize if some of the things I write seem a bit out there but that's just how I am and I don't plan on changing. I've heard of Amino but not looked into it much so I haven no idea what it's for. Is it just for fanfic or is there other K-related things? It's full of community's basically like fan pages from basically any kind of series books games movies shows music you can think of. It's really cool app you should check it out. Serenity Edwards is just a normal 20 year old who heads to LA for college to study art and design. That is until she is heading back to her apartment she shares with her cousin Madeline, and she comes upon something she's not suppose to. All to quickly she is pulled into a world of gang violence. Follow her story as she is forced to join up with a new gang that's traveled to LA from Korea to make their mark and make some big money in this gritty romantic comedy. 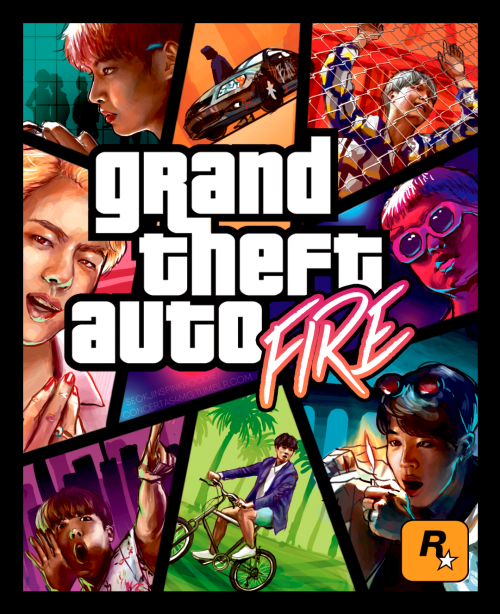 BTS/GTA crossover! Hey everyone I'm writing a book of BTS imagines. It will be made up of ones I come up with and any requests for one I may get. The first ten people that go to the book and comment on the first page leaving me an idea of what they want in the imagine and with which band member, along with which rating for the chapter will get they're imagine done first. After that I'll be looking through comments on different chapters and doing other requests as I find them. I hope you guys will check it out and enjoy!!!!! mumbled "Korean bands you should check out"
Hey guys this is a list of the Korean groups I like to listen to. With my favorite Bigbang at the top of course :) Let me know what you think of these bands and if you have anymore that aren't on here that I should check out.